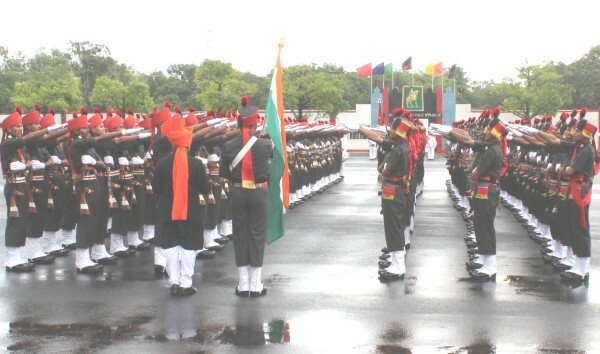 The newly renovated Talekar Drill Square of the Maratha Light Infantry Regimental Centre was the venue for the Attestation Parade of Group 4/14 recruits. A total of 237 recruits were attested and took oath to serve and protect the integrity of their motherland, even at the cost of their lives. The parade was commanded by Sepoy Prashant Shivaji Jadhav while the Parade Adjutant was Major Amit Mane. Brigadier Santosh Kurup, Bar to Sena Medal, Commandant, The Maratha Light Infantry Regimental Centre, Belgaum, reviewed the parade, which was his 15th and also the last parade, before getting posted out from the Regimental Centre. Even the adverse weather could not deter the spirit of a remarkable oath taking ceremony held in the presence of the National Flag and the Regimental Colours. The Commandant, in his address to the newly attested soldiers, reminded them of the rich heritage and glory of the Maratha Light Infantry, one of the pioneer infantry regiments of our army. He also impressed upon the young minds to follow the hard but the right path in life, like a soldier, towards their goals in life. The newly attested soldiers were beckoned, to not only uphold the annals of martial history during wars but also to remain best, even while training during peace time. The Reviewing Officer awarded the recruits for excelling in different spheres of training at the end of the parade. Sepoy Prashant Shivaji Jadhav was awarded Honorary Captain Keshav Rao Talekar Medal and Trophy for Best in Drill. Sepoy Krishna Reddy Kota was awarded Maj SS Brar Medal and Trophy for Best in Physical Training. For being the Best in Field Craft, the Colonel NJ Nair Medal and Major Satyajit Shinde Trophy was awarded to Sepoy Prashant Shivaji Jadhav. Sepoy Sikandar Chindhu Tadakhe bagged Sucha Singh Memorial Cup and Medal for Best in Outdoor Activities. While for being the Best in Firing, Sepoy Ravindra Bhila Shevale was awarded Namdev Jadhav Medal and Trophy.